This has been a fun series and - sadly - this issue apparently marks the end of it (for now). The Defenders has been a playground for writer Brian Michael Bendis, who's moving over to DC, so he's wrapping up the story in the dozens of Marvel's books that he writes (only a slight exaggeration). This series has been focused on establishing the new Kingpin of crime in New York (since the actual Kingpin is busy being the Mayor of New York over in Daredevil's comic). It all comes to a head in this issue as DD, Luke Cage, Iron Fist and Jessica Jones (who gets the best lines as always) face off against the newest and deadliest contender. It's a lot of fun throughout, with terrific art by David Marquez and excellent color art by Justin Ponsor. 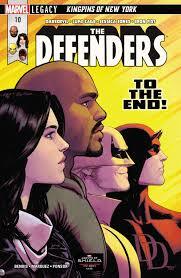 Happily, they even manage to sneak in a nice tip o' the hat to the original Defenders team along the way. If this series is ending, I'm sorry to see it go - but at least it wraps up on a strong note.